POMONA – Pomona Unified student Karina Aguilar has gained international recognition as one of only 55 students in the world to earn a perfect score on the Advanced Placement (AP) Spanish and Culture exam, also making her one of 322 in the world to attain a perfect score on any AP exam last year. The former English learner heard of the unprecedented feat during a surprise celebration with friends and family while in her AP Spanish literature class at Garey High School on Jan. 21. Aguilar, 17, is a model senior at Garey High, carrying a 4.8 GPA and juggling a rigorous academic schedule with a host of extracurricular activities. She participates in tennis, soccer and drama, is a member of the Associated Student Body (ASB) and LINK mentoring program, and is enrolled in several AP courses. All of this, she says, wouldn’t have been possible without the help of her teachers and Garey staff. 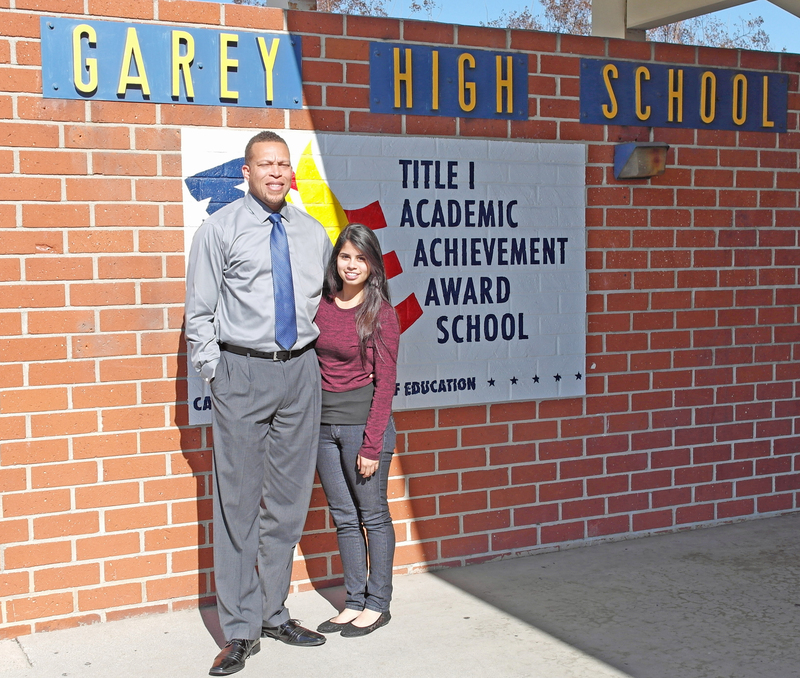 Garey High Principal Stacey Wilkins called Aguilar an inspiration to her fellow classmates and he hopes her success will entice other students to pursue AP classes. Last year, Aguilar enrolled in the AP Spanish class — taught by Jose Morales — to explore Latin American culture and learn more about her heritage. It was there that she learned skills and lessons through discussions she had with classmates and Morales. Learning from this interactive classroom environment helped her through the 65 print and audio questions and four free-response writing prompts on her AP Spanish and Culture exam. Aguilar moved to California from Mexico in 2001 and became proficient in English by third grade. She says she was motivated and inspired by her parents, who worked hard to find jobs in the United States to get their kids the best education possible. “I saw how hard it was for them to find jobs without a college education and the sacrifices they made, so I made it my mission to make them proud and to be able to give back to them one day,” Aguilar said. Due to her perfect score, Aguilar now has the opportunity to earn college credit for her AP class and plans on studying public policy with an emphasis on education at a four-year university. She also hopes to one day serve on the Pomona Unified Board of Education and continue making college more accessible. AGUILAR: Garey High School senior Karina Aguilar stands with Principal Stacey Wilkins in front of Garey High School in Pomona. Aguilar is one of 55 students in the world to earn a perfect score on her AP Spanish and Culture exam last year.